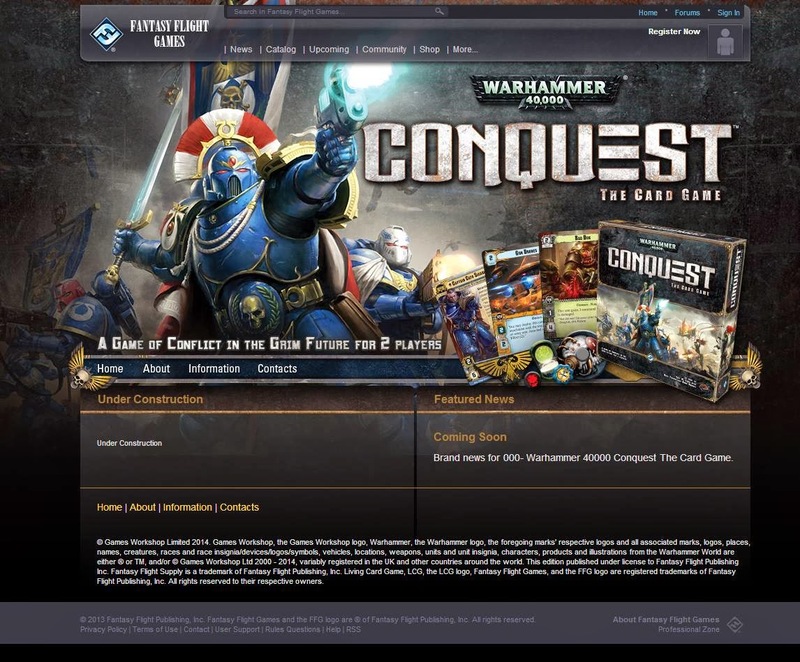 Original Story: Fantasy Flight Games accidentally teased the latest in their Living Card Game (LCG) format in the form of Warhammer 40,000 Conquest. I say teased because the site page for the new card game was quickly taken down but not before a few eagle eyed internet peeps took a screenshot. In an image that appeared on Fantasy Flight Games for a few brief moments it appears that they will be releasing a Warhammer 40,000 LCG to take the place of their now finished Warhammer Invasion LCG. Warhammer Invasion is still available but Fantasy Flight Games announced that they have stopped producing new cards for the game and that it is now complete. Looking closely at the image it appears that Conquest is based very heavily on Invasion with the cards looking to have very similar stat lines. Warhammer Invasion is a highly rated game so Conquest should shape up to be an equally cracking game. It also appears that Orks, Tau and our favourite Power Smurfs, the Ultramarines, will be included in the core game. My guess is that the core set will also include a fourth faction, mainly because four seems a nice number and there’s no appearance of any Chaos at this point and a Warhammer 40,000 game without Space Marines and Chaos is like chips without salt and vinegar. I must admit that a friend of mine predicted this and it looks like he was bang on the money. His other prediction was that Fantasy Flight Games would also release an Android/Netrunner role playing game at Gen Con, is he going to be two for two?